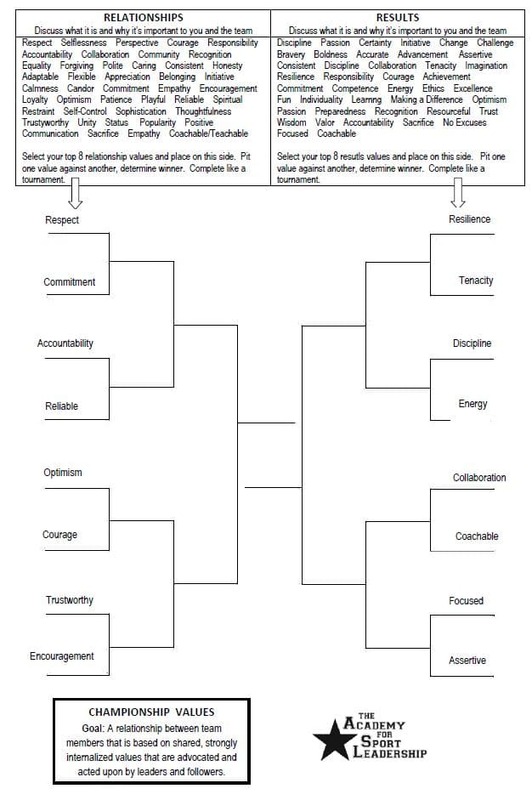 The Championship Values exercise is an interactive tool for you to use in determining your values and those of your teammates. As you work through the eight steps to your team’s Championship Values, keep in mind that sometimes the best way to stimulate discussion of values is to pose a difficult situation that demands a hard look at how a value will help you best resolve the situation. For additional resources for value-driven leadership consider The Academy for Sport Leadership’s Case Studies. determine a winner and move the winning values along toward the middle of the chart. meaningful conversation to identify a winning value. values) values that will be strongly internalized, advocated, and acted upon by all team members. The discussion should reveal values a clear-cut set of values for you and your teammates—standards of behavior towards one another and individual and team performance. upon by all team members.